← The Clinton’s Clean Up Machine? A Hillary victory means there won’t be a departure; merely a doubling-down by the elite, as they act with renewed zest to secure their interests — versus the national welfare. The Great Imposition — a war waged on average Americans — will continue with awful consequences. The worldview among many of our elite is anti-nation — dare we say — anti-American, anti-law and order, anti-tradition, anti-faith (with exceptions carved out for Islam), anti-durable values and enduring truths, like marriage between a man and woman, and family, as defined by a man, woman, and children. The elite, so very cosmopolitan, have evolved past antique beliefs and ways. The dangers are domestic and foreign. President Hillary and anti-nation elites would continue failed policies toward Islamic militants and insurgencies. They’d serve up more perverse rationalizations for why Islam doesn’t animate jihadists. More dangers in the offing with rogue nations Iran and North Korea. Mounting danger in Asia, with China, where the PRC is boldly militarizing the South China Sea. But there was a fundamental problem with the decision that you can see rippling now throughout the West. Ms. Merkel had put the entire burden of a huge cultural change not on herself and those like her but on regular people who live closer to the edge, who do not have the resources to meet the burden, who have no particular protection or money or connections. Ms. Merkel, her cabinet and government, the media and cultural apparatus that lauded her decision were not in the least affected by it and likely never would be. Nothing in their lives will get worse. The challenge of integrating different cultures, negotiating daily tensions, dealing with crime and extremism and fearfulness on the street—that was put on those with comparatively little, whom I’ve called the unprotected. The Hildebeast is a member of the political elite, those who would want to rule over the rest of the population at the expense of people like you and me. I watched a short one hour video called “Clinton Cash” (based on Peter Schweizer’s book), and the amount of money that the Clintons have reportedly stolen from the taxpayers of this country for personal gain and influence peddling is staggering. 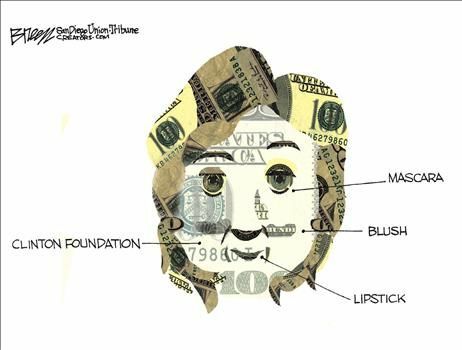 If she is elected to the presidency, then this country is for sale to the highest bidder. To do this means that she would keep this country in a state of chaos, not permitting any detractors to gain any momentum in opposing her agenda. If the past seven years under Obama is any indication, a Hildebeast presidency would be close to hell on earth. A Hillary win this November assures an exacerbation — and likely, acceleration — of troubles and conflict for a decaying, fractious society. Her victory would embolden the elite to greater highhandedness, to greater “bullying” and imposition of its worldview on citizens, who resent the trampling of their beliefs and values, and resent the elites’ notion that America is nothing more than an open-air mall, where anything and everything American can be sold, traded, bartered or discarded… where people’s livelihoods and welfare are subordinate to a global economy that mostly benefits the privileged… where nation and patriotism are dismissed as the province of yokels. Folks, we have an election coming up. There is no possible way that Donald Trump could be worse than the Hildebeast as President. At least Trump hires the best people to advise him, and isn’t afraid to fire those people who don’t measure up. That is his saving grace. This entry was posted in Conservatism, G.O.P. America, patriotism, Political and tagged Election 2016. Bookmark the permalink. Great post Tom. And great points. 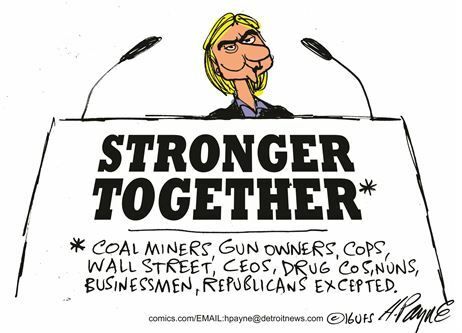 Trump is not the one I wanted but, when it comes to him or the Hildabeast….he is far far better for this country.